Discover all that Hanoi has to offer with Riverside Palace as a base. This 2-star hotel was established in 2010 and offers 24 guestrooms. All of the guestrooms are replete with non smoking rooms, air conditioning, bathrobes, desk, internet access (wireless), internet access. This Hanoi accommodation features on-site facilities such as elevator, laundry service/dry cleaning, restaurant, room service, safety deposit boxes, hotel/airport transfer, tours, business center. Modern comfort and convenience are seamlessly combined to ensure the guests' satisfaction. 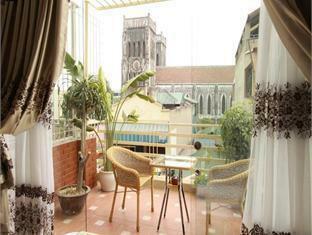 These top-class facilities are complemented to excellent services to meet the needs of visitors to Hanoi. Make your reservation at the Riverside Palace Hanoi now by selecting your chosen dates of stay and submitting our secure online reservation form.